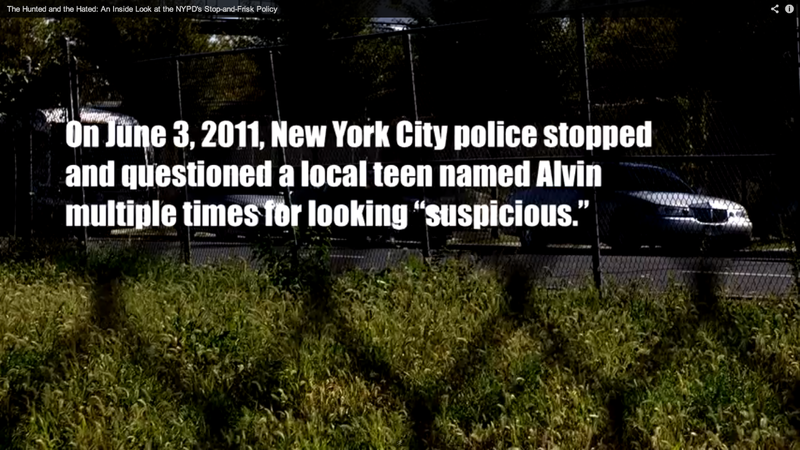 Last year, the broader public got an in-depth and disturbing glimpse into the actions and behaviors of the network of law enforcement individuals involved with enforcing Stop and Frisk practices in New York City when a young man named Alvin recorded what he described as one of the countless times he was stopped in the vicinity of his own neighborhood — his recording captures his second stop in the same day. Ross Tuttle, a contributor to The Nation, expanded Alvin’s courageous and revealing audio into 13 minute short film called “The Hunted and the Hated: An Inside Look at the NYPD’s Stop-and-Frisk Policy” in which he surrounds Alvin’s audio recording with interviews of current and former NYPD officers, legal experts, and, perhaps most effecting, Alvin and other young people themselves for whom this is not merely a policy but an everyday fact of life. This short film, innumerable personal accounts and protestation across a variety of media platforms of this policy, the ongoing battle between law enforcement brass who support this policy and the communities they serve (for whom safety is paramount, but whether this policy actually helps to achieve it remains questionable)… all of these factors have also been brought into the harsh light of everyday conversation with the ongoing trial that brings into direct question the NYPD’s commitment to stop and frisk as a way of policing. So where is the line of reconciliation? That is, where is the meeting ground between complete repeal of the policy and its continuation in its present state? This presumes of course that the desire on behalf of law enforcement is to protect communities from a persistent influx of weapons and violence, which is purportedly the intention behind what has become an increasingly polarizing law enforcement policy. Tuttle’s film and Alvin’s recording, however, make it difficult to believe that serving and protecting is at the root of the way that the policy is carried out everyday. Young people (too many of whom live their everyday lives under “suspicion” before the sun has even risen) and the communities in which they live shouldn’t exist in a constant state of fear. This is the simple point poignantly presented by Kasiem Walters, a high school senior in Flatbush, Brooklyn, in another short film called, “Stop-and-Frisk: The High School Senior,” part of the #whereiamgoing campaign. What comes through most evocatively in Walters’ narrative is the psychic weight he and his friends carry with them constantly, being stopped, having his possessions tossed on the ground, his pockets searched by grown adults — he notes that one wouldn’t understand this if it happens one time or as an isolated but rationalizable experience. No, one needs to experience being stopped, questioned, violated, treated in dehumanizing ways 6, 7, 10, a dozen, more than twenty times. For Kasiem, this experience began at the age of 13. But what is “reasonable suspicion?” The NYPD has interpreted it broadly. CCR tallied the NYPD’s own records and found that 685,724 people were stopped in 2011—the vast majority of whom were black and Latino. Nearly nine out of 10 of those subjected to stop-and-frisk were not arrested. Although Mayor Michael Bloomberg credits the policy with lowering crime and keeping guns off the streets, it has a detrimental effect on innocent people who feel targeted because of their race, class, religion, sexual orientation, gender, identity, or housing status. Critics say many stops are unlawful because they are too often based on stereotypes rather than real suspicion or evidence of wrongdoing. These are three of a vast sea of stories, encounters, and experience. Follow us on twitter (@YMediaJustice) where we’ll continue to share more young people’s stories in an effort to interrupt injustice and to educate beyond mere actions of agreement or disagreement. The issues wrapped up with #stopandfrisk are far too complicated for simple solutions. One step in the right direction, we believe, is to take the stories of youth seriously. By lalitha in Uncategorized on August 12, 2013 .